Wednesday – Sunday, 11AM – 6 PM. Klaus von Nichtssagend will present a new solo show by Benjamin Butler in its main space from February 15 through March 24. The show is titled Silver/Landscapes, and will feature monochromatic works in silver oil paint on linen. The past year gave way to a profound shift in the work of Benjamin Butler. For a 2018 solo exhibition in Vienna, Austria, the artist exhibited a group of vibrant monochromatic landscapes alongside his signature ‘tree paintings’. Within these ‘monochrome’ paintings, Butler began depicting somewhat distant landscapes as seen through the lens or filter of a single color. 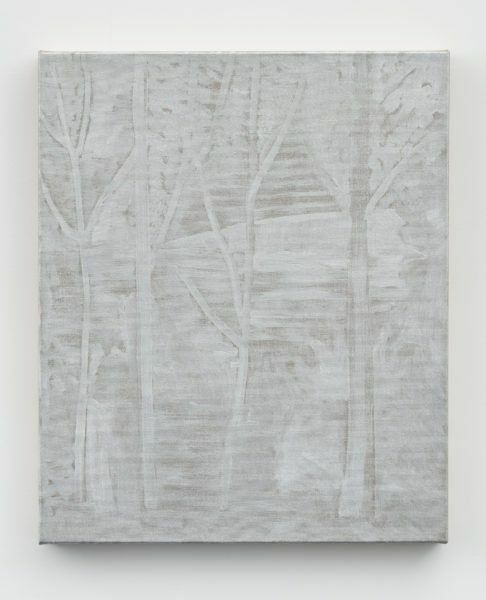 For his new exhibition at Klaus von Nichtssagend Gallery, Butler has continued to push in this direction, here employing a muted and moderately reflective silver palette. While Butler’s paint application appears to be simple and restrained at first glance, in truth his process employs a multilayered complexity that results in variation within this new pictorial language. Through the use of an underpainting and overpainting technique, Butler fuses positive and negative imagery into ever-changing and carefully balanced painterly and conceptual results. The reflective surfaces allow the viewer to subtly adjust their visual experiences by physically moving around and across each painting, as well as through the installation. The landscape images for this exhibition have been guided by a selection of photographs taken by the artist in natural settings as well as images collected by the artist from the internet. Descriptive or representational qualities oscillate as tree branches merge with atmosphere, oil paint reveals surface, and foliage flickers away. While ‘trees’ are clearly still present in Butler’s work, ‘country roads’ and ‘forest paths’ have also emerged as recurring motifs. The disarming familiarity and unabashed beauty of Butler’s contemplative and visually reflective images play against and with the artist’s growing tendencies toward an aesthetic of reduction. Butler’s paintings cut across several artistic conventions. Their muted appearance does not force interpretation upon the viewers, instead inviting them to make up their own minds about exactly what it is they’re looking at. Benjamin Butler (American, b.1975) lives and works in Vienna, Austria. He has exhibited extensively in the United States, Europe and Asia. In 2018 Butler had solo exhibitions in Vienna, Austria and Beijing, China. This is his fourth solo show with Klaus von Nichtssagend.